Ruco Chan and Liza Wang to be TV King and Queen at Singapore’s 2015 StarHub Awards? The 2015 StarHub TVB Awards Ceremony will be held on Saturday, October 24, in Singapore’s Marina Bay Sands. Although the ceremony has not yet taken place, tabloids are speculating that Ruco Chan (陳展鵬) and Liza Wang (汪明荃) will be titled TV King and Queen of the night. Edwin Siu (蕭正楠) and Priscilla Wong (黃翠如), who are a couple in reality, are said to win the My Favourite TVB On-Screen Couple awards. 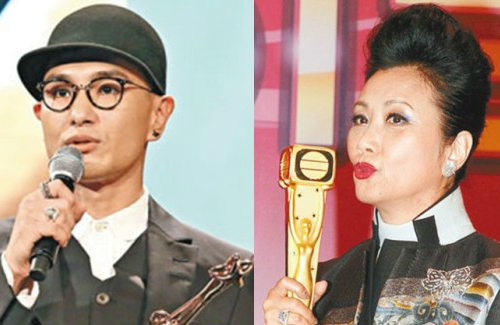 Furthermore, they are speculated to take home the My Favourite TVB Male TV Character and My Favourite TVB Female TV Character awards, which have been each awarded to six artistes last year. Priscilla expressed that if she does win an award, it will serve as her birthday gift. 25 comments to Ruco Chan and Liza Wang to be TV King and Queen at Singapore’s 2015 StarHub Awards? 華麗轉身 is a touching drama. I love the songs sung by Liza. as for TV King, it’s a no-brainer question…RUCO CHAN for his role as 11th prince, my hero. @janet72 Limelight Years is underrated and deserves more mention, even Linda acted above expectation although she is not well matched with Alex Fung. The acting this year is kind of weak. For lack of competition, Liza should get the Best Actress. Hopefully the anniversary series will provide good competition for the acting categories. Yes, 華麗轉身 was a very meaningful drama, very rare coming out from TVB studios these days. Liza, almost like playing out her life story, certainly deserves the award but mainly because no other female leads were really given any outstanding roles. As for Ruco, no brainer like you said. He’s miles ahead of anyone else and I hope in HK, TVB will do the right thing to crown him too. @rucolove oh please…don’t give it to Moses….his role in that ghost drama was hardly impressive. for that Mui, please don’t give her the most improved award because she hasn’t. hope ruco gets the award in Singapore as well as HK. he truly deserves it. @janet72 Grace is best newcomer as expected. @isay best actor award? He didn’t get TV king award? Ruco deserves the award anyway. Happy for him. @janet72 Best actor is same as TV king. Yes, he definitely deserves this highest accolade. A pity though that altho he won this title for his role as 11th prince in COD which also won the best tv drama award, he did not win the My Fav Male Char Award which is given to at least 6 actors. My guess is that they need to take his share n give to someone else to ” save face ” for that person. @rucolove there are several tvb actors invited…guess it’s not nice for them to go home empty handed. @janet72 in the past, Ruco had gone home empty handed. I wonder why Kevin Cheng did not get any award. Imo, he should get my fave male char for his role in Eye in the Sky. Could it be becos he did not turn up, they gave his award to someone else? Did that Mui 头 win anything? @janet72 She won 2 awards while Ruco won only 1. @rucolove what???? now I must say something is wrong here. how can that goldfish with no acting ability win 2 awards??? Ruco definitely deserve the My Best Actor award. Hopefully , TVB will tailor a role specially for him and cast him with stronger lead female . No more Aimee Chan or Selina Li!! But it seems that there are very few female lead in TVB these days to match him. @thpk Tavia and Charmaine are still around. Hope he will be given opportunites to act in big productions /movies. @jleee yes, agree. It always appear to me that both Linda and Ruco have that chemistry when acting together.As online couple, they will be irresistible provided that there is well written script tailor for them. @jleee yo, Linda would’ve been perfect for this Mui role. The self absorb, naivety and wishy-washy attitude is right up her alley. She would’ve been a mich more effective Mui albeit it’s still a poorly written character. If they moved Grace to Kelly’a character, I think she would’ve fared out better and gained more fan/likes. @thpk then I must say aimee is better than grace many times. Does this award mean anything? Grace won 2 awards lmao. Best new artiste because she was the only TVB’s new actress this year isn’t she? I’d rather give it to Sisley but I don’t think she was invited. Yay for Ruco! Consider me a new fan – watching CoD purely for him so his acting is really good. Even Wallace Huo couldn’t get me through Perfect Romance due to my apathy to Tang Yan ! I finally watched the show, late I know lol. Shesh, I thought tvb gala was lame. This one was worse. It was practically dead with lots of empty chairs and nothing interesting. The singing was horrible except for Loius Cheung. He should’ve won the fav song, but you know the other 2 did bc face it, or else why the hell thwy invited non-acting peeps lol. Linda was most hilarious. Her singing sucked, couldn’t hold a note or even loud enough but she tried to be fancy with head and hands movement. Girl, pls, you couldn’t hit the right key or belt with a still-mic. Gawd, I felt embrassed for her lol. Liza and Loius dramas are most underrated.